SelfWipe is a bathroom toileting aid for those with difficulties cleaning after using the toilet. The SelfWipe makes post-toilet cleaning possible for people with a myriad of physical disabilities and mobility challenges, such as difficulty bending or limited use of hands and arms. 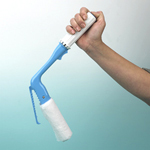 The rotating handle allows the desired mount of toilet tissue to be rolled. The tissue is then place around the angled clamp on the lower portion of the device. 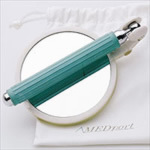 After use, the tissue is dicarded by pressing an easy-to use relese button on the end of the handle. Handle measures 9 3/4 in. Angled clamp portion measures 5 in. The overall length of the toilet aid is 14 3/4 in. Made of sturdy plastic. Autoclavable. Use with No Rinse Peri-Wash for added personal hygiene. 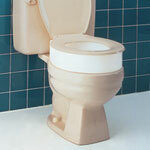 This toileting aid is a tremendous aid to independent living.